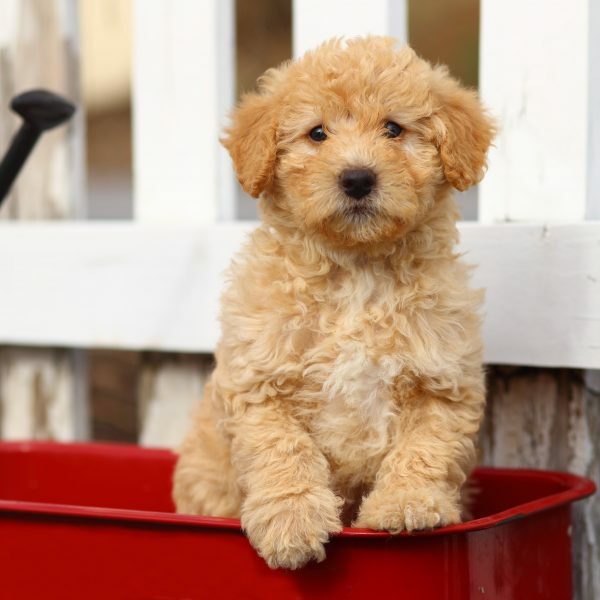 The Miniature Aussiedoodle is a designer mixed dog breed that is recognized by the American Canine Hybrid Club (ACHC), International Designer Canine Registry, Designer Breed Registry, and Designer Dogs Kennel Club. The Mini Aussiedoodle, also sometimes referred to as a Miniature Aussiepoo, is a smaller version of the larger Aussiedoodle. It is a cross between an Australian Shepherd and a Miniature Poodle. Their smaller size and sweet disposition make them great companions as well as therapy dogs and emotional support dogs. Miniature Aussiedoodles are friendly, affectionate, devoted to their owners, and highly intelligent. They are lovable balls of fluff with a lot of energy that get along with children, other animals, and other people. Their friendly nature and openness do not generally make them good guard dogs. But, they can be good watchdogs in the sense that they will let you know when someone is around. They may inherit the herding instinct from the Australian Shepherd side. That, paired with their playful nature, could culminate in your Miniature Aussiedoodle attempting to herd family members to keep them in the same place. Training early on can curb any herding tendencies that start to show. Mini Aussiedoodles adapt well to any living situation, but can be more sensitive to weather. Due to their smaller size, they are less able to handle very hot or very cold weather. That is something to keep in mind when you take them outside during the summer or winter. Keep their coat groomed shorter in the summer, make sure they get plenty of water, and watch them closely to ensure they don’t get overheated. In the winter, keep their coat groomed at a normal or little longer length and bundle them up with some winter dog gear to help them handle the cold better. They do tend to do best in a home with a yard where they can run around. But, with proper exercise and plenty of attention, these dogs can adapt to apartment living as well. They crave attention from their families, so do not like to be alone for long periods of time. This mixed dog breed can sometimes develop separation anxiety. Oftentimes, a good workout before you leave plus some challenging puzzle toys can help them handle alone time a little bit better. There are health issues to be aware of with any dog breed and mixed breeds are no different. Sometimes the genetic variation in the mixed dog breed can result in some immunity and sometimes the mixed breed is still susceptible to the health conditions common in both parent breeds. Mini Aussiedoodles are generally very healthy dogs, but some health conditions to be aware of are deafness, allergies, epilepsy, hypothyroidism, and hip dysplasia. The genetic history of the parents and the results of any health tests can help you determine what to expect and allay any potential health concerns. Between their intelligence and their higher energy level, Miniature Aussiedoodles are highly trainable, but can also be a handful. Dog owners with some experience with high energy breeds tend to be a better fit for this mixed dog breed. Novice owners can have success as long as they live an active lifestyle, are capable of handling a high energy dog, and are willing to enroll in obedience classes to help them nail positive training techniques. Mini Aussiedoodles love having a job to do and are eager to please. They also tend to be sensitive souls, so it’s important to keep training positive with rewards and praise. This mixed dog breed will pick up on things easily, but will also tend to get bored. Ensuring they have a job to do goes a long way in keeping this energetic pup occupied. They also tend to be athletic, so can be good candidates for dog sports like rally, obedience, flyball, and agility. 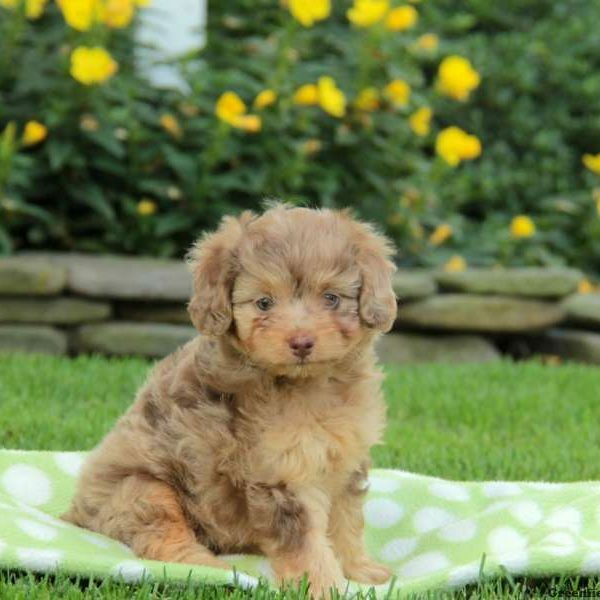 Because of the mix between the Australian Shepherd and the Miniature Poodle, coat colors and patterns will vary with the Miniature Aussiedoodle. The texture will be soft and will likely be low-shedding with some hypoallergenic properties. However, their coat is not low maintenance. It can be long and straight, curly, or anything between. You will want to brush your Mini Aussiedoodle a few times a week to keep their fur free of tangles and to prevent matting. You will also want to get them professionally groomed every 2-3 months. Their ears will need to be checked regularly to ensure they are clean and dry and their nails will need to be trimmed monthly. Brushing your dog’s teeth regularly is also important to prevent tooth decay and gum disease. Daily tooth brushing is ideal to prevent tartar buildup. 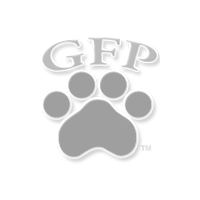 Getting your puppy used to having their paws and ears handled and introducing them to having their teeth brushed early on will make grooming and care much easier as they grow. This is a moderate to high energy mixed dog breed that needs plenty of exercise, attention, and mental stimulation to remain happy and healthy. Walks a few times a day and active playtime every day should be sufficient. This pup requires an active lifestyle, so engaging in more rigorous activities like swimming, hiking, dog sports, or taking trips to the dog park are also a good idea. Ongoing training and ensuring your Mini Aussiedoodle always has a job to do will keep your pup happy and generally well-behaved. If left without a job or proper exercise, they will often find ways to entertain themselves, which can result in destructive behavior. Miniature Aussiedoodles usually stand between 14 and 19 inches at the shoulder and can weigh 15 to 35 pounds. With mixed breeds, looking at the size of the parents can give you a good idea of what to expect as your puppy grows. The Mini Aussiedoodle usually lives 10-15 years.